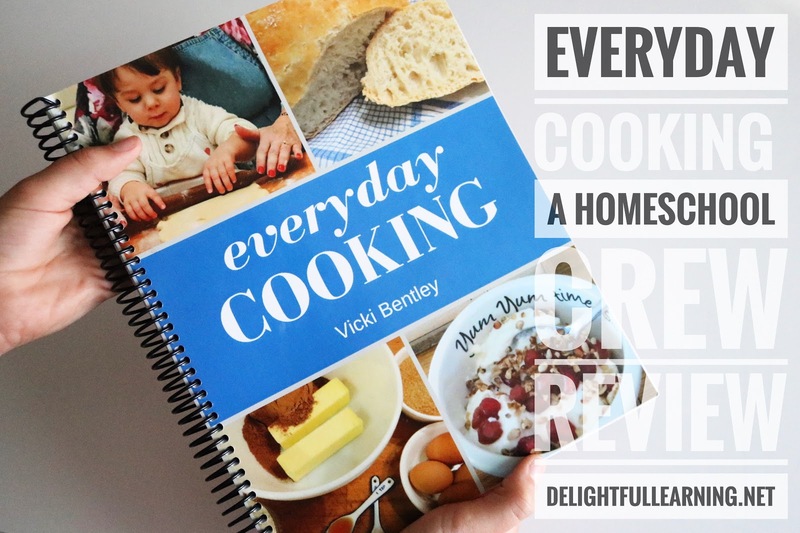 Everyday Cooking is a 194 page spiral-bound cookbook (also available as a PDF download) by Vicki Bentley from Everyday Homemaking. The emphasis of the cookbook is on whole food cooking, but Mrs. Bentley and her family are not purists, so it's not a health food cookbook (nor a low-sugar cookbook), but some healthier substitutions are suggested, and she even has a few low-carb, low-sugar options and substitutions. In this review, I will share about all the yummy food I've had coming out of my kitchen, but I'm mostly excited to share about a few new favorite recipes like the Salmon Spread. This is the easiest way to eat canned wild-caught salmon. It's so simple too. I tried it with a homemade version of the dressing and loved it. So did my kids. We are eating it with gluten-free crackers and on toasted bread like you'd eat a tuna salad sandwich, and we like it both ways. I'm also excited to share about Crio Bru. I had never heard of this before, but it is roasted cocoa beans that are course ground and brewed like coffee in a French press. I can't have caffiene, so I'm always on the look out for an alternative to coffee, and Crio Bru is warm and chocolatey! It tastes like hot cocoa, but not exactly. I prepare it with cream and stevia or other sweetener, but it's my new favorite way to enjoy a cup of hot cocoa - coffee style! I'm loving the cookbook so far, but much of this is how I ate before starting Trim Healthy Mama (THM), which she mentions and highly recommends and even has a few similar low carb recipes, such as a Gentle Sweet, a Super Sweet, and a Brown Sugar Substitute. I love that. After three years on THM, I forgot how to cook normal, so I can already tell this cookbook will be a blessing for my family... but not my waistline! Let's dig in, and I'll share how I got started with this cookbook! I needed something for dinners for a busy couple weeks coming up, so I turned to Main Dishes & Soups & Sides and started by trying her shopping day Ground beef ideas. I bought two big packages of ground beef from Costco and browned some for hamburger gravy, made a huge meatloaf and a half-sheet pan full of meatballs, and then froze several pounds for grilling burgers later. So, that's exactly what I did not knowing she has an actual meatloaf recipe in the book! This is usually how I cook, but I did look up the recipe later. The only problem I have with her recipe is that you can't salt or pepper raw meat to taste, so I guessed and under salted the meatloaf and meatballs. My regular recipe calls for 1 1/2 tsp salt and 1/2 tsp pepper per two pounds of ground beef, so I'll measure that amount next time. One thing I can say is that I've not had so much good food coming out of my kitchen at once in a long time! Mondays in our home are often Mama Mia Mondays - Italian dinner night. If I ever have a glass of red wine on a weeknight, it's Monday night. I used to put the wine in my spaghetti sauce, but I don't anymore since a friend told me about adding Worcestershire sauce instead. I play Italian dinner music to set the mood, and I make my usual spaghetti (or lasagna on a special occasion, like when Nathan comes to visit because it's his favorite). This night we had spaghetti and meatballs (or pskghetti as Bo still calls it) and No-Knead Crusty Bread. I have made the recipe that inspired the one in the book many times and for many years. This is my favorite recipe because the longer you ferment it, the better it is for you because the sugar feeds the culture and makes it lower carb. It's crispy on the outside, but soft and chewy on the inside, though it is difficult to cut - you need a good bread knife. I use a special whole wheat white that is not enriched, and it's so wonderful to be able to eat bread on occasion! Especially hot and fresh out of the oven slathered with butter to go with spaghetti and meatballs! I served a salad with homemade ranch, too, but I don't think anyone ate salad that night. Hubby put in a request for cookies, so one afternoon I made the Neiman Marcus $250 Cookies which uses ground oats instead of flour. I love oatmeal cookies, but this is not a recipe I could eat very often because they have a lot of sugar in them. But for special occasions, they would be fun. I made pancakes for breakfast one morning. The recipe calls for two tablespoons of baking powder, and I though that was a lot because I usually use two teaspoons. I added it to the liquid ingredients before adding the flour because I like to make sure it is all mixed in, and it bubbled up quickly to the top of my batter bowl. I stirred it to pop the bubbles before I added the flour. But, the batter was so thick that I had to use a muffin scoop to make a pancake. I flattened it out a little when I flipped it, but it was still too thick. I thinned the batter with water, and it made delicious pancakes, but they were thin. I'm pretty sure the batter thickness had to do with me using a store bought organic white wheat flour instead of fresh milled soft wheat flour because fresh milled flour is lighter and less condensed. Sure enough, flour must be reduced. I also received confirmation that 2 tablespoons is correct, but less can be used for thinner pancakes. So, I made them again the next morning, this time I used 1 tablespoon of baking powder and less flour and they were perfect. They were still fluffy with half the baking powder (as pictured above), and I won't be going through my can of baking powder too quickly this way. For dinner one night, I made Mom's Roast which is my new favorite roast recipe. I roasted two three-pound roasts and each recipe made a moist, tender, and delicious roast with it's own gravy. Each pan had almost a quart of gravy - my husband was so pleased. I didn't have cornstarch, and try to avoid it, so I had to make one substitution and use my own homemade cream of anything soup instead of her CreamO mushroom soup. I have a favorite country sour cream muffin recipe that I like, so I was a little hesitant to try a new muffin recipe, but I thought I'd better try them since I'm reviewing this cookbook. So, I made the Basic Muffins recipe for the kids for breakfast one day. I didn't care for them because they tasted floury and were not as moist and flavorful as the recipe I use. They use 1 cup more flour than my recipe and makes the same amount, so I won't be making them again. My husband considers himself a chocolate chip cookie connoisseur, and he said the chocolate chip cookie bars are the best cookie bars he'd had. Elli, who is 10, made a chocolate bundt cake on her own. The frosting was delicious (of course, it was made with powdered sugar). The cake itself was good, but a little dry - probably a little over baked. But, she said it was easy to make, and she thought it was good even though everyone picked the frosting off and didn't eat the cake. One day I was craving chocolate and unintentionally made six pounds of fudge. Oh my, it was delicious! I wasn't intending to double the recipe, but I bought a large can of evaporated milk instead of a small and didn't want it to go to waste, so doubled it at the last minute. Six cups of sugar, two bags of large kosher marshmallows, four cups of chocolate chips, and three sticks of butter later, and I had six pounds of fantastic fudge. Unfortunately, I ate more than I should, and it triggered an inflammatory response in my body, so I decided to lay off the sugary recipes from now on. That's when I discovered the Salmon Spread. After a few days of detoxing from the sugar and carbs, I started to crave real food again and really wanted salmon. I looked up salmon in the index, and that's how I found the recipe and my new favorite way to eat canned wild caught Alaskan salmon. Beginning on page 145, there is a Meal Planning / Shopping Hints section. It includes menu ideas, how to grocery shop with a list, and tips on how to stick to a budget while shopping. She includes both sample menus and blank menu planning forms in both a calendar and list format. This section also includes a reference to the three main factors in food selection, according to Dr. Rex Russel's book, What the Bible Says About Healthy Eating. One of the factors, she quotes, is to "eat only what God intended for food," which I wholeheartedly agree with and practice, so it was disappointing to see that the cookbook includes pork recipes. Pork is not considered "food" according to the Word written in Leviticus 11. The back also has a checklist of Basic Cooking Skills, a Food and Nutrition Mini-Unit, and a list of basic kitchen accessories and equipment, as well as slow cooker and pressure cooker recipes. The index of recipes in the very back of the book lists each recipe by name in alphabetical order. I appreciated this because these are in italics, and it is very easy to find a recipe that I've already used. There is also an index of Time-Saving Tips. Her stories throughout the book are funny and down to earth - she calls them "broken eggs" and are about the "oops" moments in her kitchen. They have made me laugh out loud a time or two. I have always wanted a Titus 2 woman in my life, so I love the spirit behind her book as well as her realness. Overall, we really enjoyed this cookbook and look forward to using it more, and while I enjoyed all the fun treats, I think I'll keep the sugar and white flour recipes to a minimum from now on. Connect with Everyday Homemaking on Facebook, who is temporarily offering 10% off The Everyday Family Chore System and/or Everyday Cooking (print or e-book) through Labor Day! The code is TOS10books -- you can apply it to as many books in your cart as you'd like, but you do need to add it to your cart and apply the 10% discount code last. Expires Sept 5, 2017. Thanks so much for your honest and thoughtful review. For the run at the printers as I type, the baking powder amount for the pancakes has been adjusted, so hopefully that will make your breakfasts simpler! So glad you enjoyed the salmon spread -- I love that I can serve it with GF crackers for a yummy, protein-packed treat! You've made me hungry!!! We need a meal make over in our home and perhaps this would be a way to do it. Thanks. Everything looks so yummy. Your daughter made a beautiful looking cake too. Michelle, I made the mom's roast too--and as you know we are beef "farmers" and so roast is a common meal. I have made it over and over...BUT NEVER like this one. woh Nelly. My husband (now after eating it 3 days later as an open faced sandwich using the roast's gravy) has said it is hands down the best roast he has ever eaten. Which is high praise indeed. It definitely went to my big huge star recipe list. I will have to try the fudge recipe since my husband adores fudge. Hmm. And apparently the chocolate chip cookie bars. We did the spaghetti sauce and the no-bakes which were major hits. Since I did my review, we have done the roast and also the 60 Minute Rolls and the pancakes. I agree about the pancakes. WAYYY too thick. My husband says he likes the flavor of my normal recipe more--funny since it's my gluten-free recipe. hahahaha. But all in all...this cookbook is going to be my go-to. That IS saying a lot! I want to try the spaghetti sauce next. I went to make it yesterday, but I didn't have canned tomatoes, so I made the Alfredo instead (with meatballs!). Have you posted your gluten-free pancake recipe? I really need a good one! I'm really excited for your menu planning series! I am sooo much like you when it comes to cooking (the fly by the seat of my pants part, lol). I wish I loved to cook as much as you do! I do it because I have to, LOL!